Whether this is a "Once in a lifetime" trip or an annual event, you will feel at home in our home on your Hawaiian vacation. After ten years of renting from others, we have purchased our own Hawaiian Condo and are proud to offer it to you . 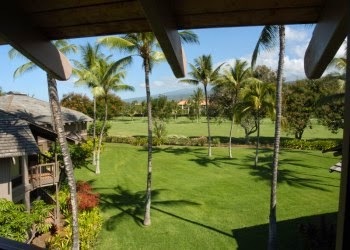 With over 1500 square feet of living area plus three lanais for your privacy and relaxation, our unit is perfectly situated on the 11th fairway of the Kona Country Club Golf Course. It is completely furnished, with space enough to comfortably accommodate up to six people. Located in Keahou, at the south end of Kona, in the oceanfront Kanaloa at Kona, Outrigger Resort, it enjoys the reputation of being the nicest resort complex in the Kona area. Kanaloa is situated on 18 acres of meticulously maintained, secure 24 hour gated complex just 14 miles south of the Kona airport.